Hallmark Channel’s Count the Ways Sweepstakes – Win a Sandals Resort Caribbean Getaway & more! Win a Sandal Resorts Caribbean Getaway & monthly prizes for a year! ENTRY LIMIT – Only one (1) entry per person/email address per day and one (1) additional entry per game, per day. Only one (1) additional entry per person will be issued per game, per day, despite multiple plays. ELIGIBILITY – The Sweepstakes is open to legal residents of the fifty (50) United States and the District of Columbia who are at least 21 years of age. 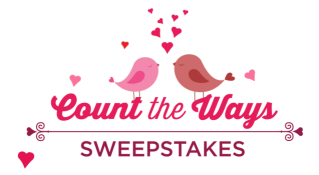 SWEEPSTAKES ENTRY PERIOD – Hallmark Channel’s Count the Way’s Sweepstakes starts at 9:00 a.m. Pacific Time (“PT”) on January 25, 2016 and ends at 9:00 p.m. PT on February 15, 2016. (1): From the Prize Provider: One (1) 4-day/3-night Luxury Included® stay for two (2) adults to any of the fifteen Sandals Resorts listed below located in either Jamaica, Antigua, Saint Lucia, The Bahamas, Barbados or Grenada. 2) From the Prize Provider: two (2) coach-class round trip air transportation tickets on a carrier of the Sponsor’s choice to/from the nearest major US gateway of the Grand Prize winner to the resort designated airport. 3) Sandals Resorts is a Luxury Included® resort destination. Therefore, the prize provided will include luxurious accommodations consisting of one (1) room double occupancy, all meals, unlimited premium brand beverages, daily and nightly entertainment, all land and water sports, including scuba diving (for certified divers), snorkeling, Wi fi in all rooms and public areas, gratuities, and transfers to and from the resort designated airport. Telephone calls, Red Lane® Spa treatments and services, specialty dining, tours & excursions, inter-island transportation, SCUBA certification courses, island departure taxes and purchases made at the Sandals Specialty Shops are not included. 4) The Grand Prize will be issued in the form of a certificate provide by Unique Travel, Corp. The Grand Prize is NOT transferable or redeemable for cash. No extension will be given after the prize has expired. If the prize is not redeemed, the prize is void. Approximate Retail Value (“ARV”) of Grand Prize: $4,000. The Grand Prize winner will also receive all of the below monthly gifts (not to exceed $300 per month) to be provided by the Sponsor. Approximate Retail Value (“ARV”) of Grand Prize Monthly Gifts: $300 per Month or $3,600 Total. Total ARV of all prizes: $7,600.